This new flavor by Tajin comes to you exclusively at MexGrocer.com only. Enjoy the habanero taste of Tajin fruit and snack seasoning. This new flavor of Tajin has a touch of habanero with 100% natural lime and with the best quality. Habanero chili has beneficial effects for health, and helps combat pain, relief migrantes and prevent some types of cancer, like intestinal, colon and stomach. Its consumption can reduce the amount of cholesterol in the blood and decelerate the aging process. Contains more vitamin C than other citrus. 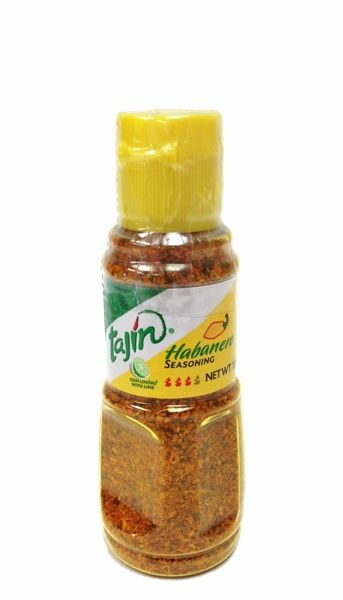 Tajin Habanero is ideal for: meals, snacks, fruits and vegetables. As always..Tajin is Sugar Free! Be aware, this stuff is really HOT and it's not a candy. Ingredients: habanero chile, ground chilies, salt, lime juice, dehydrated and 0.5% silicon dioxide. Check out some great Tajin Videos. Another excellent product, but expected a lot more heat? Worked great as a dry rub for pork & chicken. This habanero seasoning is very similar to the quality and and taste of the regular Tajin fruit and snack seasoning, but it has a much stronger punch in heat for those who like it extra hot. It's not going to burn your mouth or leave you in pain. On the contrary, the way the habanero is used here, it brings out the best of it's flavors. A fine product, I highly recommend it.